Musa acuminata ssp. banksii (F. Muell.) Simmonds is a subspecies of Musa acuminata, the wild species involved in the domestication of the vast majority of cultivated bananas. It is one of the four main subspecies of Musa acuminata that contributed to the genetics of edible bananas. However, it was originally described as a species, Musa banksii, by the German-Australian botanist, Ferdinand Jacob Heinrich von Mueller. The accepted name is Musa banksii. Molecular analyses of genebank accessions have found alleles specific to banksii in nearly all edible diploids. 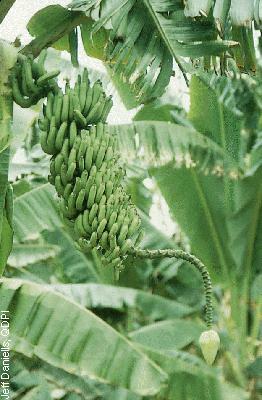 Several banksii alleles have also been found in important triploid subgroups such as Plantain and Cavendish. This suggests that some of the first forms of edible bananas may have arisen in New Guinea from wild populations, and early primitive cultivars were transported by humans to other regions where they then crossed with other subspecies of Musa acuminata. In addition to the huge diversity of edible diploids in New Guinea, parthenocarpic semi-wild forms have been documented in modern times which could represent transitional forms akin to those selected by early farmers thousands of years ago. The Musa acuminata component of the Iholena and Maoli-Popoulu subgroups is also predominantly of banksii origin. Cultivars in these subgroups, along with Plantains and the edible diploids from Papua New Guinea, tend to have relatively high levels pro-vitamin A carotenoids. It has been noted that these bananas have in common to be derived from Musa acuminata ssp. banksii. The genome of a genebank accession of Musa acuminata ssp. banksii has been sequenced. New Guinea, Australia and Samoa (most likely introduced). In Papua New Guinea: 'Waniga' (generic name for wild bananas in the Dagua area and 'Kusu labu' (Timbunki language at Ambunti, Sepik. In Samoa: 'Fa'i taemanu' (wild banana in Samoan). "Pseudostem up to 6 m tall, 80 cms girth at the base, usually a distinctive chocolate brown in colour but sometimes almost green. Sap watery or a dirty cream colour. Rhizomes short but the suckers arising sufficiently far from the parent to grow more or less vertically upwards. Suckering usually prolific; the plants sometimes forming broad clumps. Shoulder brown or green, always with a broad (> 1 cm) appressed scarious margin. Petiole commonly mostly brown in colour sometimes pale green with or without a glaucous waxy bloom, the margin erect and distinctly scarious, canal large; TS ratio 1.2. Lamina green non-waxy above, paler green and variable in waxiness below, the base left-handed cuneate; PB ratio 4 - 5. Peduncle usually coarsely hairy, brown or green. Bunch typically hanging approximately diagonally downwards but light bunches are sometimes almost horizontal and heavy bunches near vertical. The bunch also varies from dense to lax and sometimes exhibits irregular fruit-setting particularly in the proximal hands. Fruits usually strongly negatively geotropic and rigidly erect but sometimes more or less ageotropic and forming irregular bunches. Basal bracts long, lingulate and quickly falling. Basal flowers usually hermaphrodite although commonly with less than the full complement of fully developed stamens. The oldest one to three hands, often functionally female only. Pedicels, variable, 1 - 3 cms long. Young fruits glabrous, pale green or sometimes mottled brown after insect damage; ovules in two rows per loculus. Mature fruit ripening yellow, often discoloured brownish by insect or other damage to the skin, indehiscent, not strongly aromatic. Seeds small, dark brown, 4 - 5 mm diameter, smooth or faintly vertically striolate, hilum small, hardly sunken but with a slightly raised collar, the umbo hardly raised. Male peduncle very characteristically at first growing almost horizontally although becoming diagonal under the increasing weight of the developing fruit, later becoming positively geotropic and descending vertically. Male bud convolute, slender and pointed, 2 - 2.5 times as long as broad, variable in colour from pale green or yellow to deep dull red or purple often somewhat waxy. Male bract dull outside, coloured as the bud, shiny inside and pale green to pink or red, the colour always fading towards the bract insertion. Bracts lifting to a low angle and then rolling backwards and quickly falling. Male flower cream, the compound tepal c. twice as long as the free tepal. Compound tepal with bright sulphur yellow tips. Free tepal translucent white, ovate-acuminate with a distinctly wrinkled area at the base of the acumen. Chromosome number 2n = 22." Musa banksii was first described in 1863 by Ferdinand von Mueller from plants collected in Queensland, Australia. E. E. Cheesman reviewed the species in 1948. Though he did not choose to reclassify it at that time, he did note its affinity with Musa acuminata and speculated on its relationship: "Both type and variety cross readily with forms of Musa acuminata Colla and give fertile hybrids. On this ground, as well as on consideration of the many close resemblances between the species in habit and floral characters, I am very doubtful whether Musa banksii ought to be maintained as a species at all. For the present it may be maintained for convenience, but intermediate forms may be discovered in New Guinea or the Moluccas connecting it so closely with the polymorphic Musa acuminata assemblage that it has to be reduced to varietal status. On present evidence we regard it rather as 'replacing' typical Musa acuminata at the south-eastern extremity of the range of that species, but its genotypic differentiation is evidently slight." It wasn’t until 1957 that Norman Simmonds reclassified it as a subspecies of Musa acuminata based on extensive field observations in New Guinea, Australia and Samoa, as well as crossing experiments in Trinidad. Simmonds noted that the number of ovules per ovary was on average higher than any other forms of Musa acuminata recorded at that time, correlating with large fruits and a higher number of seeds per fruit, making it an ideal candidate for breeding purposes if disease resistant specimens could be identified. The Musa of West Papua have only been scantily studied, and Simmonds hypothesized that another unique form may be present to the west of Papua New Guinea, and its introgression into eastern populations may be responsible for the greater variability observed in Papua New Guinea. George Argent chose to treat it as a species, and was not convinced that Simmonds’ evidence was sufficient to warrant subspecific status. Nevertheless, he was intrigued by Simmonds’ theory of unique populations to the west, even going so far as to use that as justification to withhold the status of subspecies until further field studies could be conducted. Even farther to the west in the so called “triangle” of East Kalimantan, Maluku, and Lesser Sunda Islands of Indonesia, collecting missions in 2012 and 2013 revealed forms of Musa acuminata speculated to be close to ssp. banksii, but with unique characteristics, potentially giving weight to Simmonds’ 1957 theory. Henry Vare and Markku Hakkinen suggested preserving Musa banksii at the species status following Argent. This recommendation comes after citing that Simmonds & Weatherup and Kenneth Shepherd considered it a species, though that is not precisely the case. Both sources suggested it may be more distantly related to other forms of Musa acuminata, but do not go so far as to say it should be treated a distinct species. Analyses done on the genome sequence of a genebank accession support the classification of banksii as a subspecies of Musa acuminata. 1. Simmonds, N.W. 1956. Botanical results of the banana collecting expedition, 1954-5. Kew Bulletin 11(3):463-489. 2. Perrier, X., Bakry, F., Carreel, F., et al. 2009. Combining biological approaches to shed light on the evolution of edible bananas. Ethnobotany Research and Applications 7:199-216. 3. Perrier, X., De Langhe, E., Donohue, et al. 2011. Multidisciplinary perspectives on banana (Musa spp.) domestication. PNAS 108(28):11311-11318. 4. Mueller, F.J.H. von. 1864. Musa Banksii. Pp. 132-134 in Fragmenta Phytographiae Australiae, vol. 4. 6. Carreel, F. et al. 1994. Evaluation de la diversité génétique chez les bananiers diploïdes (Musa sp). Genetics Selection Evolution 26 (Suppl.1):125s-136s. 7. Davey, M.W., Van den Bergh, I., Markham, R., Swennen, R. and Keulemans, J. 2009. Genetic variability in Musa fruit provitamin A carotenoids, lutein and mineral micronutrient contents. Food Chemistry 115(3):806-813. 8. Pereira, L.C. 2009. Provitamin A Carotenoids Content in Musa Fruit: Genetic and Ecological Distribution and Rapid Pre-Screening. MSc Thesis, Institut Supérieur d’Agriculture de Lille, France. 9. Rouard, M. et al. 2018. Three new genome assemblies support a rapid radiation in Musa acuminata (wild banana). Genome Biology and Evolution, evy227, https://doi.org/10.1093/gbe/evy227. 10. Argent, G.C.G. 1976. The wild bananas of Papua New Guinea. Notes from the Royal Botanic Garden, Edinburgh 35(1):77-114. 12. Simmonds, N.W. 1962. The evolution of the bananas. Tropical Science Series. Longmans, London, UK. 170p. 13. Cheesman E. E. 1948. Classification of the bananas. III. Critical Notes on Species. d. Musa banksii. Kew Bulletin 3(2):154-27. 14. Hermanto, C., Sutanto, A., HS, E., Riska,, Alfons, , Hosang, E., Daniells, J. and Hilman, Y. 2014. Triangle Banana Exploration Report, North Sulawesi and North Maluku, Indonesia. 6-24 October 2012. Bioversity International, Montpellier, France. 14p. 15. Hermanto, C., HS, E., Nasution, F., Riska,, Malia, E., Nofriarjasri,, Daniells, J., Sutanto, A. and Hilman, Y. 2014. Triangle Banana Exploration Report, Central Maluku and Lesser Sunda Islands, Indonesia. 16 February - 6 March 2013. Bioversity International, Montpellier, France. 18p. 16. Häkkinen, M. and Väre, H. 2008. Typification and check-list of Musa L. names (Musaceae) with nomenclatural notes. Adansonia 30(1):63-112. 17. Simmonds, N.W. and Weatherup, S.T.C. 1990. Numerical taxonomy of the wild bananas (Musa). New Phytologist 115(3):567-571. 18. Shepherd, K. 1990. Observations on Musa taxonomy. p.158-165. In: Jarret, R. (ed.). Proceedings of Identification of Genetic Diversity in the genus Musa, Los Banos (PHL), 1988/09/05-10. INIBAP, Montpellier, France. Contributors to this page: Anne Vézina and Gabriel Sachter-Smith . Page last modified on Thursday, 11 April 2019 16:29:58 CEST by Anne Vézina.